Discussion in 'The Lounge' started by Morgan Willows, Oct 7, 2013. So now the fish is mine. I named him Jim (yes, it's a Doctor Who joke). He's still in the tiny beta bowl for right now but at least he's not swimming in two inches of brown scum anymore! I'm going to get him a new tank setup today once my ride gets off work. I'll have pictures of the new tank when I get it (because I'm totally going to want to show off, haha). Anyway, I'm going to have to get some tank cleaners that Jim won't murder (he's very territorial and, as has been mentioned, a serial killer, so no fishy roommates for Jim) . My mom suggested apple snails but I don't know much about them other than they're snails (and I assume Jim would have a hard time murdering a critter with a hard shell). I'm open to any suggestions. gang of goldfish ( after they'd polished off all the other fish ) ate him too. Oh no, poor clam. I don't know, then. He's only one fish >.> maybe I should ask when I get to the pet store. I always thought it was normal for goldfish (I don't know whether that applies to Jim) to have slightly murky water. When I had them, I was told to change only 2/3 water per clean, and clean once a week. 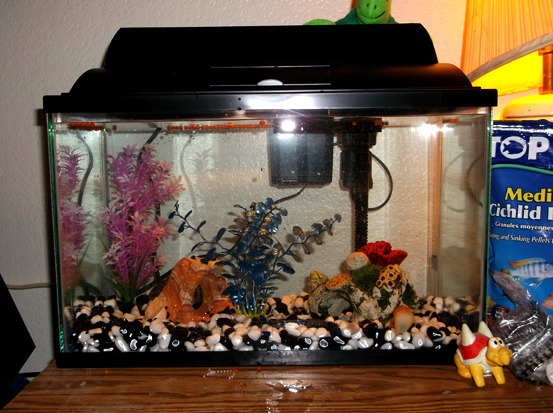 They had a nice big aquarium, and they'd make it murky within a few hours of the last clean. They did well though, my uncle inherited them when I moved, thy are still going strong. I have two goldfish in a 20 gallon tank. I have a 'living' filter with the tiny worms that eat the stuff that gets stuck in the filter. My tank stays crystal clear, all the time. I have one of those magnetic cleaner thingys and it works well to occasionally wipe the insides down. Well, iirc, the 2/3 change out is to avoid shocking the fish with a totally new environment all at once (for a human example, someone used to breathing in heavy pollution can get a little light-headed if they're suddenly exposed to very clean air). And yes, goldfish often make the water murky because, while adorable, they're messy little things, haha. A filter or cleaner critters might help a bit along with the 2/3 change out. 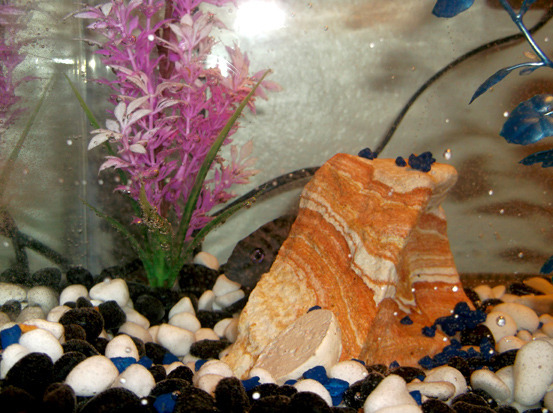 With a filter, you can change out the tank less often, so like once every two weeks. But if the system you've got works, it works. Yay happy goldfish. Jim's got his new tank! Here's Jim being camera shy. And here's one of Jim's new snail friends, Harold. There's also a black snail named Dan but he's hiding behind the decorations. Jim's been swimming around like crazy, checking out his new stuff and saying hello to the snails (and not trying to murder them, yay!). Success! I have a happy fish! Harold. I want one of those. Jim is adorable. He reminds me of a tadpole, only fish-wise. How big do you think he'll get? Well, he's about 3 inches long right now and supposedly convict cichlids usually grow to about 5-6 inches in a decent tank. So he's about half grown right now. 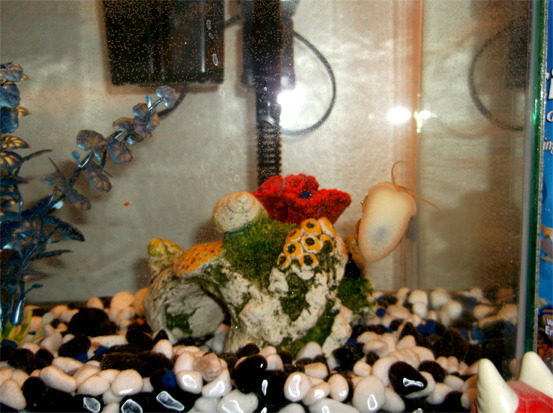 Harold and Dan are both apple snails. They're both about the size of grapes right now but, as the name suggests, they can get very big (about the size of an apple). An apple? The cuteness will grow?! O-O... And Jim! 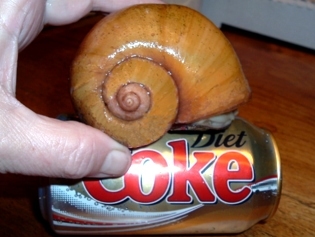 Hopefully he doesn't eat the snails when he gets that big.